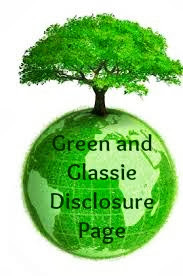 Green and Glassie: Glassie Monday - What does glass COE mean? Glassie Monday - What does glass COE mean? Hi...Thanks for joining me for Glassie Monday. Each Monday I will be posting about Glass. Different kinds of topics all related to Glass. This Monday I want to talk about Rate of Expansion of glass. Did you know that all glass is not equal. Coefficient of Expansion "COE" is a property that every material has. The COE of every material is based on chemical, structural and physical factors of the material. When glass is heated it will grow by a amount proportional to it's COE for every degree the temperature increases. In my art glass I often take two pieces of glass and make them one by heating them to about 1475 F degrees. I must make sure that the glass I use has the same rate of COE. If I do not - the glass will expand at a different rate - causing the glass to be unstable. Unstable glass can shatter at anytime. It is important to always know the COE of each piece of glass I use to make my art. My hubby was a glass marker...his knowledge makes my life much easier. I am lucky to have a expert right in my home. He spent 20 years working with a major glass company perfecting their glass. His knowledge is why I am able to combine many recycled glass products matching their COE. Each glass artist has a favorite COE. My favorite is 90 COE glass. I started glass art using 90 COE and it is still my favorite. When making a project that is not made out of recycled glass I prefer using Bullseye 90 COE Glass made in Oregon. Check out the picture of one of my Jager Trees made using a Jagermeister Bottle. Unique Recycled Art! Perfect ornament or sun catcher! I break the Jager bottle - design the tree with the broken pieces then heat the tree to approx. 1450 degrees turning the broken pieces back into a solid piece of glass. 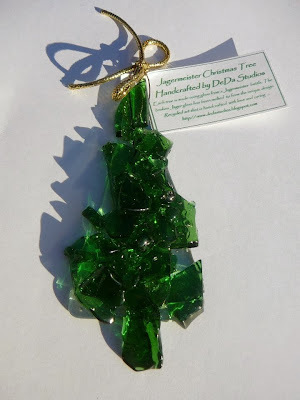 I got the idea for the Jager Tree one day when I was washing bottles for sun catchers. While I was washing a Jager bottle I thought gosh this would make a beautiful Evergreen Tree. I then started to figure out how to make a tree out of the Jager bottle. Here it is! My Jager Tree! I make 100's of these...I mail them all over the country. Germany orders quite a few...but then Germany is the home of Jagermeister! The green bottle makes a beautiful evergreen tree. Well time to get making some glass for my fair next Saturday....gosh I love my life! Have a great day! Yesterday at the art fair..Jager Trees were a hot seller.